Upon completion of a complete floor stripping, or even a rinse/cleaning of your hard floor surface, mix 1 to 2 ounces of "Film Off" per gallon of hot water. Make sure to use a new, or thoroughly cleaned mop bucket. Simply rinse your floor with a mop on application, or by using an automatic scrubber and following our auto scrubbing procedures. Allow the floor to dry completely, then apply your floor finish as you normally would. 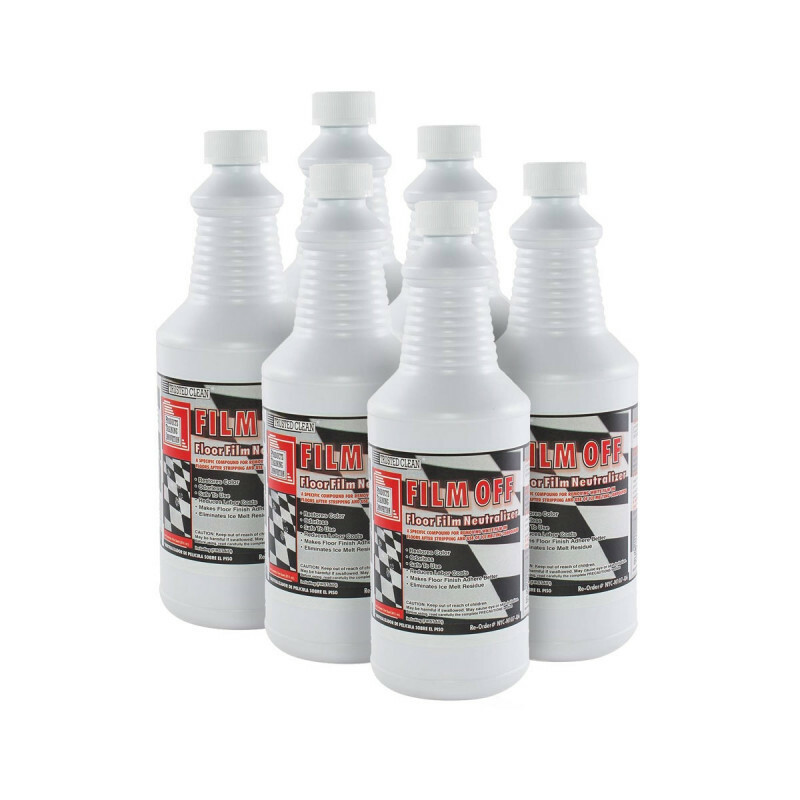 This help extends the life of the finish, improves appearance and extends the time between strippings. The white alkaline film left on floors after stripping, or after using ice melting compounds can prevent floor seals and finishes from adhering properly. Ice melting compounds can also dull and damage floor finish. Film Off can restore colors and neutralize the floor surface to ensure maximum performance from your floor finish. To neutralize ice melt residue, dilute 2 ounces per gallon of water and mop floor with a clean mop, change water frequently. Film off can also be used as a carpet rinse with an extractor, like our hot water carpet extractor, to remove that graying effect that can occur after carpet cleaning. The carpet can be left in alkaline condition when using a powerful cleaning agent and will need to be neutralized, much like a floor, to achieve a truly natural state. You can read more about these procedures in our carpet cleaning extraction instructions guide. If you looking for a product that strictly removes ice melt, please take a look at our Concept "915" ice melt residue remover, which can be found along with this product in our floor cleaning soaps & solutions category. Customers who were interested in the Trusted Clean 'Film Off' Floor Film Neutralizer & Cleaner - 6 Quarts were also interested in the following items. This is a review for the Trusted Clean 'Film Off' Floor Film Neutralizer & Cleaner - 6 Quarts.